Steve Wozniak (or Woz to his friends and admirers) not only founded one of the most important (technology-wise) and influential (culturally) companies to date but he also practically invented the personal computer. His design, that of interfacing with a computer using a keyboard and screen, is still the standard today. Before Woz conceived the PC people would use toggle switches for input and look at indicator lights to determine the output. Computers were for professionals and hobbyists only, they were not practical, not for personal use and certainly not affordable. The importance of the Apple I’s design was its usability and simplicity. Woz would design a computer, then redesign it to work the same way with fewer chips and parts. Fewer parts means fewer points of failure, means increased reliability [and lower cost]. This policy is the pinnacle of engineering, still evident in Apple’s clean and friendly designs of today. 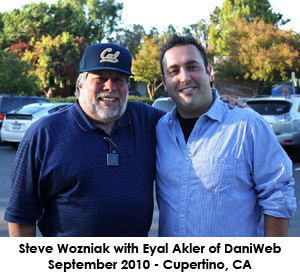 DaniWeb caught up with Woz recently for a few questions.Eyal Akler (DaniWeb): In your book you mentioned that early on you learned what it means to be an engineer, “an engineer’s engineer,“ can you tell what that means? Is there a fundamental rule to being an engineer? Steve Wozniak (Woz): I wanted to be among engineers as my friends. Also, I liked designing products that engineers would use. So I was their engineer in that sense. DaniWeb: You worry about people a lot. What worries you the most? Woz: I worry that in wealthy societies we haven't arranged the distribution of wealth to virtually ensure a lot of what we call a decent life. I would much rather live among people who almost all have what they need and have little reason to cause problems in society. I worry that two people who have the same value in my mind will wind up in different positions in society such that one has power over the other. Those with the power don't want to share it but rather increase the amount of it. DaniWeb: One could argue that religion holds innovation back, that since it is not “testable” it cannot be proven and true and therefore it clashes with science. Following in the footsteps of your father you never really got involved with religion. Do you believe that is a secret to being an exceptional engineer? Woz: I think that exceptional engineers and inventors can be religious or not. I don't see them as dependent aspects of life. The sorts of training and practices of engineers probably causes most of them to rely on scientifically demonstrable and testable things, since it becomes a major part of their lives. This goes against religion is some sense, but there are grades of religiosity. DaniWeb: Do you think the first microprocessor was designed to do what you figured out it could do or was that a lucky accident? Would someone else have figured it out if not you? Woz: The first microprocessor was designed for many jobs, but not full computer replacements. When things increase exponentially (Moore's law) you don't see very far ahead until it's happening. DaniWeb: You wrote about how the original Pong game really made an impression on you, sort of turned something on in your head. Is that when you first decided to make a PC that can play video games, with graphics and sound? Woz: When I saw the first Pong game in a bowling alley, I just knew that I wanted one. I had no thoughts that a computer could ever play Pong. These were hardware devices back then, due to what chips could and couldn't do. Eventually when I had a computer of my own, I thought of adding the pieces to it that could play games like Breakout and Pong. DaniWeb: For the record, do you consider March 1975 the official start of the PC revolution? DaniWeb: Back when you designed the first PC, before what we know as “the information age” there was a lot more room for a truly revolutionary product such as the PC. Do you think there can be another “revolution” in technology given that the internet makes everything so public, so fast? Woz: The computer was a tool that opened the world of economics to everyone. We are not at such a state that a piece of technology can solve, that I can see, now. Maybe the 'cloud' is an idea that makes computers and communication almost free. We could use a much less expensive internet not under control of carriers and cable companies. For example, why is international data on cell phone so expensive when the internet is basically free? DaniWeb: Apple really took off in the late 1970s, the formula for success turned out to be the Apple II + VisiCalc + Floppy Disk. But Apple did not always produce successful products. In fact one of Apple’s biggest flops to date was the Apple III, a PC designed by a committee [not a single engineer], designed for business consumers by marketers. In your book you wrote that you “don’t believe anything really revolutionary has ever been designed by committee,” tell us what you mean by that? Woz: Everyone has heard that everywhere. No comment, but it applies where it applies. DaniWeb: Is that why Apple’s competitors could not design a better product for so long? Woz: Actually, we really had a supreme technology (IP) lead. The Apple ][ features of color and graphics and direct video memory and game paddles and expandability were far ahead of their time and similar to nothing before or that could be expected in an affordable form. DaniWeb: In fact most companies, Apple included, continue to design most products today “by committee,” so what changed? Have we evolved? Woz: Strong central control by Steve Jobs today avoids obnoxious products and features. DaniWeb: Had it not been for the massive failure of the Apple III would the IBM PC not have surpassed the Apple PC? Woz: IBM had huge marketing channels into the enterprise, who would be buying hundreds and thousands of computers. It was easy for companies who bought mainframes from IBM to buy PC's now. I think that's the main reason. 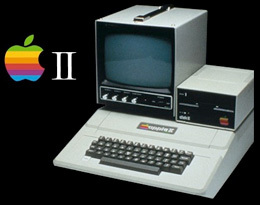 Plus the Apple III had huge problems from day 1, hardware and software, and thus got an unfavorable reputation with buyers and retailers. It was hard to recover from that. A hot product has to sell right from the start. DaniWeb: In the mid-1990s Apple went through another rough patch with the Mac. Many customers lost confidence when Mac OS 7 crashed so much for most users. You personally discovered that Internet Explorer was causing Mac OS 7 to crash, and those with other browsers [like Netscape] were not crashing. Do you believe IE might have been designed to crash the Mac on purpose? Woz: I don't think so. I have no reason to think so. This is an accusation of a bad thing. In such a case the burden of proof is upon the accuser. DaniWeb: Not long before Apple became a public company you offered to sell a substantial number of your shares at an extremely low price. You felt that Apple employees who were offered stock options deserved shares for all their hard work. This was called “The Woz Plan.” When Apple Computer went public in 1980 it had the largest IPO since Ford Motor Company (1956) and it created more instant millionaires than any company in history. Were many of these “instant millionaires” due to the Woz plan? Woz: Yes. I thought that more than a few top people deserved to share in the success. At HP everyone shared in the profits via a profit sharing distribution every quarter. At Apple I had to give my own stock to do this but I felt in my heart that it was good and right. DaniWeb: You even gave some shares away gratis. How much stock did you end up keeping? Woz: I gave all my shares in this deal at the lowest price I could sell them. I did give larger amounts for no money to people who had been with us from way back, when we were all young kids. They made it worth doing and helped motivate me and deserved a lot for that. For the record, Steve Wozniak did not ever “leave” Apple. In 1987 he stopped working at Apple full-time so he could start another company but he has remained an Apple employee and still is today. At the time Apple’s growth and success made it less possible for Woz to work as a single engineer (like he used to) so he stepped aside to allow the company to grow and others to shine but he was never disgruntled and he never left Apple. DaniWeb: You used to design computers, even software on paper. When you moved on from Apple you invented the universal remote control and started the company CL9. What were you using to design the remotes? Still paper, or were you using computers by now? Woz: I used 3 or 4 different computers in that endeavor. I wrote 6502 (enhanced, from some company like Mitsubishi) code on my Apple ][c and used it as a terminal to inject the code in our prototype. I used a desktop Mac to interface with our 4-bit microprocessor development kit and develop code for it and debug. I had a Macintosh for in-company communication too. I did a lot of 4-bit microprocessor code on paper, playing with difficult ideas. This sort of microprocessor is harder to write code for. DaniWeb: Which computer did you design the universal remote control on? Woz: (above) - also I paid an Apple engineer, John Arkley, to modify the Apple ][ debugging code I'd written to add the features of the enhanced 6502 we used. Then the remote control prototype became its own development system. This was very successful. I like developing code right on the machine it will run on. DaniWeb: Was this a major goal for inventing the PC, to use it to design the products of the future? Woz: Yes. It was the goal I was familiar with. This and games were my main 2 personal goals. I used a computer at HP to help me design calculator chips and I inteded to use my own for this rather than reserve time along with dozens of engineers on a single computer. I wound up doing this. DaniWeb: Are you still an engineer today? That is, are you still designing and building things, even if just for fun? Woz: Not exactly. I wish I were, but I have been so giving of my time to anyone who wants it, good to fans and press, that I have less time for designing now. I miss it and sometimes get to it for small projects. DaniWeb: Pranks and practical jokes have always been a big aspect of your personality. You’ve been known to play pranks on school mates, a president and even the pope. Should we be expecting any more public pranks or jokes soon or are you done with that? Woz: I do great pranks all the time, every day. I hope to publish a book on them soon. DaniWeb: We had dinner together last month in Cupertino and you pulled up in your Toyota Prius [a hybrid car]. You made a good point about how you were “being green” but that green is just a label. Would you care to make that argument here, for our readers to see and possibly respond to? Woz: Consumers make lots of 'green' choices but they are choices to be green in one area and the science/economics winds up being equally 'dirty' in other places but not addressing or seeing them. Pollution comes from energy usage and there are reasons of trade that keep this as a pretty constant ratio. Same for the percentage of energy that is green vs. dirty. The amount anything costs represents the energy of all the steps to manufacture it. This a $20,000 car (over its lifetime) is $20,000 worth of 'dirt' and a $500 bicycle is only $400 of 'dirt'. But what happened to the other $19,500? It went into energy at a fairly constant rate of dollars per amount of 'dirt'. That's the simple explanation. Our consumer choices are indeed zero-sum decisions. It doesn't apply to the production of energy. If you could build a power plant that is green (solar thermal) and operate it for the same total cost as a coal burning plant, it's greener, including the energy to make and maintain that plant. I hope a top economist picks up on this and does all the math (that is intuitive for me) and gets a nobel prize. The best decisions stat with acknowledging the truth, even if it's unpopular. So I call myself green whenever I do green things (like using cheaper goods) but really it's just a label that each of us have. It represents how we feel about ourselves. DaniWeb: Finally, let me ask you about your current company, Fusion io. Please tell us when and why it started, what your involvement and role is and what exactly your products do. I heard of some very impressive numbers and performance claims. Please, tell us more. Woz: Fusion-io analyzed the way to use NAND flash chips to replace hard disks. It's like electronics versus mechanics. 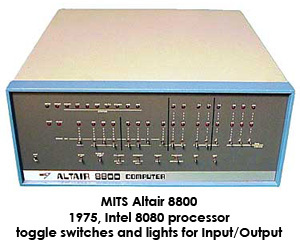 The founders, David Flynn and Rick White, saw that plugging boards of this memory into the PCIe bus of servers (good speed balance) rather than implementing SSD's, which sit out on the disk structure, separated from the processor by cables and formats and aggregators and RAID arrays and more. It works today but it's not more efficient like the PCIe solid state storage boards are. I appreciate this kind of thinking and it matches my own thinking that I valued when I designed things like the floppy disk drive for Apple. Also, this is a huge market, basically ALL of the storage of the internet and other networks. Nothing can stop this change and it's well along already. There was a time when Drexel University in Philadelphia was one of the first colleges using computers. You had to punch holes in a stack of cards and then feed them to the computer to communicate with it. Actually it is debatable if University of Pennsylvania had the first digital computer. The ENIAC was invented by J. Presper Eckert and John Mauchly at the University of Pennsylvania and began construction in 1943 and was not completed until 1946. It occupied about 1,800 square feet and used about 18,000 vacuum tubes, weighing almost 50 tons. Although the Judge ruled that the ABC computer was the first digital computer many still consider the ENIAC to be the first digital computer. See our ENIAC dictionary definition for additional information about this computer. Because of the Judge ruling and because the case was never appealed like most we consider the ABC to be the first digital computer. However, because the ABC was never fully functional we consider the first functional digital computer to be the ENIAC. Nice interview. I remember those days. Sadly I had to jettison all my old PC projects from the 70's. I wrote my first research paper on a CPM machine and went on to win the Nobel prize (with Robin Warren) for that work. Barry Marshall, Perth, Australia. Thanks for this wonderful interview. Thanks for the kind feedback folks, enjoy! I do agree with your opinions.Thanks for your appreciation.I really appreciate for giving this information.Very well said, thanks for all.I will try my best.I expect you will also give this type of information in future. Although WOZ could conceivably be called the inventor of the personal computer The statements about 'interfacing with a computer using a keyboard and screen' and 'toggle switches for input and look at indicator lights', leaves a false impression. 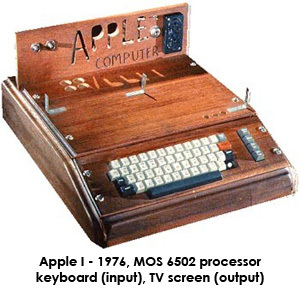 Prior to the Apple people could use terminals, so they were in effect interfacing with the computer using a keyboard and screen, the only difference being with the Apple the terminal and screen were more integrated with the computer, and even with the Apple the screen (in most cases a TV) was separate. As far as I understand, in some cases the initial boot sequence may have been handled, by toggle switches, but eventually it would have been handled by a ROM. My first computer was a "strong" Sinclair ZX-80 using a "really fast" 1 MHz-Z80 with the "fantastic" amount of huge 2 quilobytes(KB). Was it created before or after Woz's Apple? - I remember I had to learn Z80's Assembly to build decent programs (games), Basic Language programs used a big amount of memory, therefore the economic way was Assembly. Does anyone remember the audiocassete beeing used to record/read the programs? Great, Thanks for the information.Nice interview Keep it up. Like the fact that nothing has "ever really been designed by committee". As an Engineer, I wholeheartedly agree and would, at the present moment in time, point to the European Union as a prime example. An old adage states that too many cooks spoil the Broth. Read This, You Must: For Thought-Controlled Technology Has Arrived! Who's Going to Develop an Ideal Academic eBook Reader?